Asia, Freedom, Huemanity, Living Abroad, Living in America, Living in Singapore, Marriage, Reflective, Revolutionary, Social Issues, U.S.
A year ago, my husband and I watched the streets of Ferguson erupt in horror. We watched pictures and videos of the lifeless body of one of our young brothers fester in the street for hours and heard about the culprit’s, an officer of the law, flee from the scene. We learned that Mike Brown, a recent high school graduate, was struck six times with bullets, at least once with his hands raised in surrender, and later heard the trigger-puller’s legally justifiable defense was that he looked like a “demon.” (How can one be executed for looking like a mythical creature?) 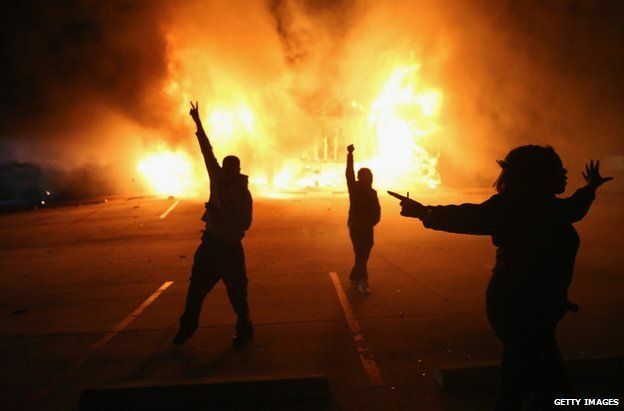 Our eyes widened and spirits were awakened and angered as we witnessed the unfolding of a war zone in Ferguson. Gas masks, full artillery, violent and silent protests, arson, police antagonists, and antagonizing police officers, all painted a vivid and horrific picture that resembled that of which we’d seen in visuals after the King riots, both Rodney and Rev. Dr.
We waited like the rest of Black America for some semblance of justice in the name of the fallen. We waited, though we had still not recovered from the verdict in the trial of Trayvon Martin, who was posthumously convicted of his own death. 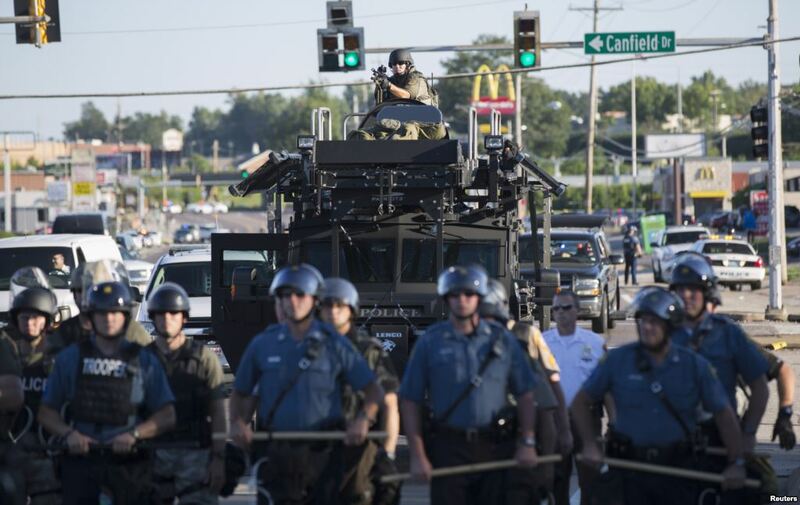 We waited, though we’d be told of the imbalance of Ferguson’s demographics in terms of police vs. residents, and its sordid history because of it. We waited though the media had already begun assassinating the character of the victim before his body had even been removed from the scene of the crime. We waited like viewers wait for the moment in a scary movie for the running, screaming, female character to get caught. We hoped for the best, but we all knew she would fall and fail. And, so did justice in this instance. 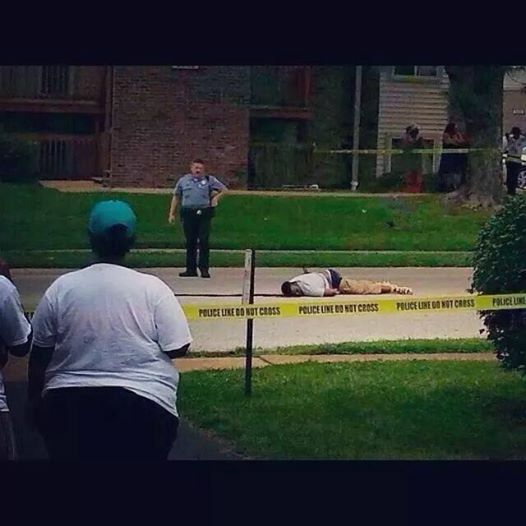 I watched Mike Brown’s mother, Leslie McSpadden wail and weep and scream out of agony. Then, I watched her transform and become swathed with a supernatural strength. She reminded me of Sybrina Fulton. She reminded me of Wanda Johnson. She reminded me of Mamie Till Mobley. She reminded me of too many black mothers that have buried their children due to senseless violence that’s sanctioned by the government that should protect them. We sat in silent reverence, imbued with fury, and watched images of our home country burning from the comforts of our foreign home in Singapore. We watched, just as we had watched the marches, protests, and riots after Trayvon Martin’s injustice unfold while being surrounded by the opulence and newfound freedom of self-expatriation. We felt, for the first time in our lives, disconnected from our people as though we’d absconded from the plight and constant terror that it means to be black in America. We decided, with much reluctance on my part, that we needed to move back to the states; that despite the intoxicating and unfamiliar feelings of privilege, entitlement, and freedom, true uninhibited freedom to live and be who we culturally are without judgment or persecution, we needed to commit to our life’s work of helping to restore and rebuild black communities for the sake of our children and our people. We needed to sacrifice the contentment of our bubble in Asia where we had helped to establish a vibrant black community to begin the Back to Black List that my husband authored where it was needed most. We had to do more than use words to empower. We had to be examples and SPEAK with our actions. The decision was less noble than necessary. A year later, our feet are on the ground. We’re back now. We’ve used this entire summer to live as nomads in different states as we researched our selection of cities to live. We gave ourselves the freedom to choose exactly where we wanted to live instead of being mandated by a professional position. (See another post that I’ll find the time to write one day.) Our original list of five plus one had been narrowed to two and a possible by the time we landed on U.S. soil for the first time in two years, but we kept all options open for discussion and consideration. New Orleans and Oakland were both individual choices vetoed by the other for various reasons. [Insert sigh.] The wonderful city of Chicago which offers all of the culture, food, arts, and opportunities to build and restore is just too cold for too many months out of the year for this Southern girl and this adapted N. Minneapolis snowbird. My flashbacks from living in upstate NY for one year kept haunting me. 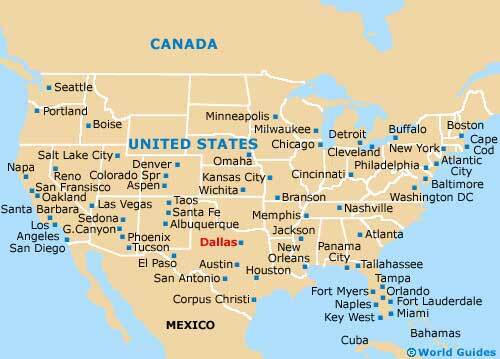 That left Dallas, Atlanta, & S. Florida as possible contenders. Our first choice of Dallas was a practical one. The primary reason for moving back more urgently was because of my mother-in-law’s crippling illness and my sister-in-law’s need for assistance in her care. Living in Singapore made any necessary trips to visit very difficult and even scheduling phone calls could be a nuisance with the time difference. We needed to be in the same country to be able to reach them when needed. They both reside in Dallas. Dallas also boasted of thriving predominantly black suburbs [read communities], a once thriving black community in South Dallas that could be restored, and many fellow FAMU graduates that we knew would be willing counterparts in the process of rebuilding. Though I’d never been, I encouraged the decision to have all of our items from Singapore shipped to Dallas as a gesture of my commitment to both the Back to Black List and to my mother-in-law and husband. Atlanta is Atlanta. Those who get that just do. I love just about everything about my native city and I’ve converted a man who once denounced the very thought of visiting to possibly considering it as a place to settle. We knew it’d be easy to a certain degree to just plug into the well established black network we have there. There are many like-minded people of all races that live in the city and many upper middle-class and affluent black families that haven’t forgotten that they are and the responsibility that comes with that. But, it’s still in Georgia; red state, redneck, red clay, historically black lynching Georgia. So, there’s that. South Florida is all things tropical and beautiful. Who wouldn’t want year-round summers, mango and avocado trees in your backyard, free daily lessons in a foreign language, and access to the beach whenever? The king’s company, www.madalihair.com, also has its main large clients and distributors in Miami. But aside from the aesthetics and his professional benefit, it proved not to offer much for black families in general and didn’t feel as though our vision would be well-received. Surprisingly, Tampa, my maternal families’ home base made an addition to the list after we arrived. We used it as our home for the summer, renting an airbnb home from a wonderful couple who lived just two doors down from us in the newly gentrified West Tampa. We caught wind of some exciting and new opportunities in the area and were reminded of how wonderful it is to be near family and a familial support system, especially when raising children. There were definitely pros and cons as with each location. We had all the offerings of tropical life and there are many avenues for rebuilding, but the black community is built around elite organizations, historic churches, or childhood allegiances that are all difficult to penetrate for transplants. I went to high school in Tampa and I’m a member of one of the elite organizations and a former member of one of the historic churches, and I still feel like an outsider at times. We needed a city that would welcome newcomers as people migrated to help implement the Back to Black List and one that offered varying commercial industries for those who’d seek employment rather than create it. Tampa became possible, but not likely. We spent time in each of the cities searching for homes to either rent or buy, looking for black schools, black banks, and black neighborhoods that could be the foundation for black communities. We were repeatedly disappointed in them all, but especially Dallas initially because that’s where we put the most effort. Our first visit there in June proved to be surprisingly underwhelming. The article we’d read about one of Dallas’s suburbs becoming the new Black Wall Street was a bit misleading, or perhaps we misinterpreted. Black Wall Street was replete with black businesses that were supported and employed by black people in a community built around strong black schools. I think we are collectively and mistakenly interchanging community and neighborhood. 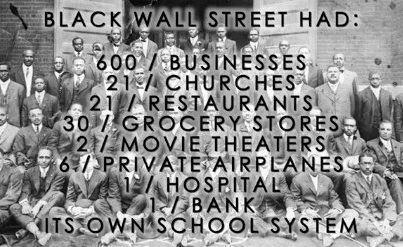 Black Wall Street was a community. The black suburbs of Dallas appear to be black neighborhoods. Communities have their own economies and a sense of collectivism. Neighborhoods are just people who share the same zip code or grocery store. We didn’t find the former there. [Please let us know if we overlooked something Dallastons.] More importantly to me, the school that we fell in love with proved not to be the best fit for our daughter. down exactly what I wanted, not my husband or children, and to be as specific as possible. All summer, we were leaning on the kindness of others or spending far more than we should to ensure that we, our children especially, were comfortable as we scoured the internet, traveled the highways, and rested in airports in search of our next home. I knew I wanted an African-focused accelerated educational venue for my daughter where I too could contribute my educational experience and knowledge. I knew I wanted a community that spawned from that school, neighboring schools like it, and like-minded people and families. I knew I wanted to finally find a church that espoused the beliefs and understanding that Africans throughout the Diaspora are disenfranchised and that we can be liberated through our faith and collective actions. But, those things weren’t specific enough. So, I made it plain. -to live in my native city this year. -to have my daughter enrolled at the African-focused school of my choice there in Kindergarten or based on her aptitude and social development instead of age. -to have a support system of like-minded people. -to live in a house in the actual city limits, within 20 minutes of the school. -to have at least three bedrooms in said house. -to have a church home within the community. -to begin working together with others to implement the Back to Black List as soon as possible. In one day, after many days of tirelessly searching and being disappointed repeatedly in multiple cities, we have finally found a place to call home and truly begin to work towards the liberation and advancement of the disenfranchised. That’s putting a lot on it as my husband would say, but we’ve already put a lot on the whole decision to move back to the U.S. As soon as I decided to envision and ask for exactly what I wanted, the path became clear and easy. I found a house in the exact area we wanted to live. It was available, move-in ready, and we were able to negotiate all of the terms we wanted in less than a week. I’m able to enroll my daughter in her proper placement in the African-focused school of my choice, and I’ll be surrounded by people of all backgrounds and ethnicities who understand the importance of elevating those who’ve been oppressed. And, we both have family there, so that’s built-in babysitters!! All is not final. We will still be living out of suitcases and boxes for a while, but we’ll be in our own space soon enough ready to do more than watch the plight of those we love. After much indecision, insight, trials, and prayer, we are moving to……….A-T-L-A-N-T-A!!! Your gift of sharing your experiences, insights, epiphanies is vividly and wonderfully constructed and conveyed, what a joy you bring to the readers, me! With love and appreciation….. Thank you so much!! The greatest gift to any writer is to actually have their work read and appreciated. 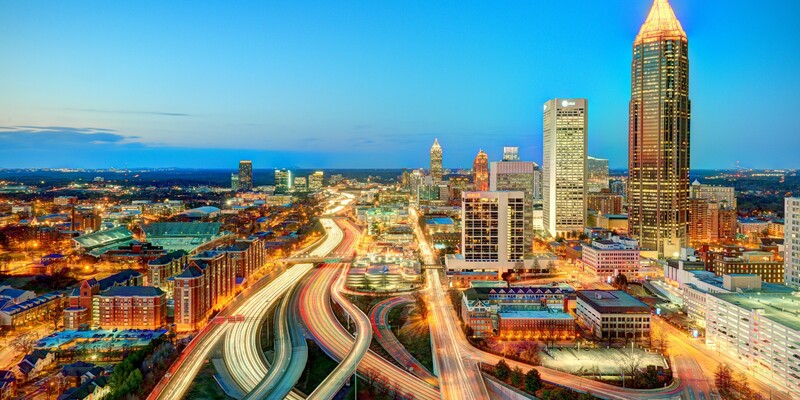 Had a great time reading the background behind your decision to move to Atlanta. Excellent read and I look forward to you guys having much success.